We are learning about the weather in Kindergarten. This week, we discussed how we protect ourselves from weather. 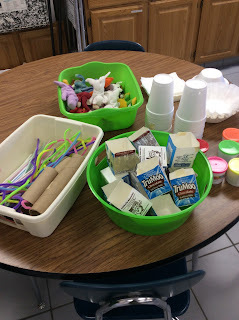 Two major NGSS standards can be met with this activity in a simple science way! 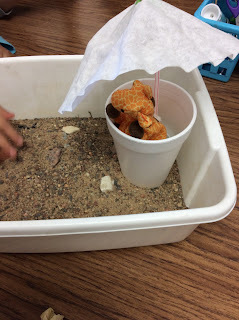 *I also put out a bucket of sand on blue paper so it looks like it is at the beach! They put their protectors in the sand then for the full effect! STEM supplies at the STEM Store! 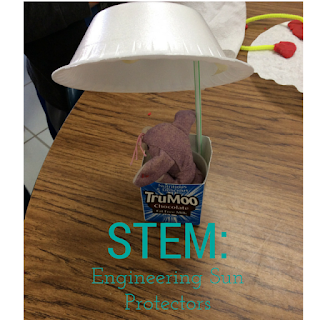 One of the many sun protectors that were made! This is a fun and easy way to add non-fiction reading, NGSS standards, and a STEM project to your day!